These sweet guava cupcakes are so pretty and delicious - they will be the hit of any party. 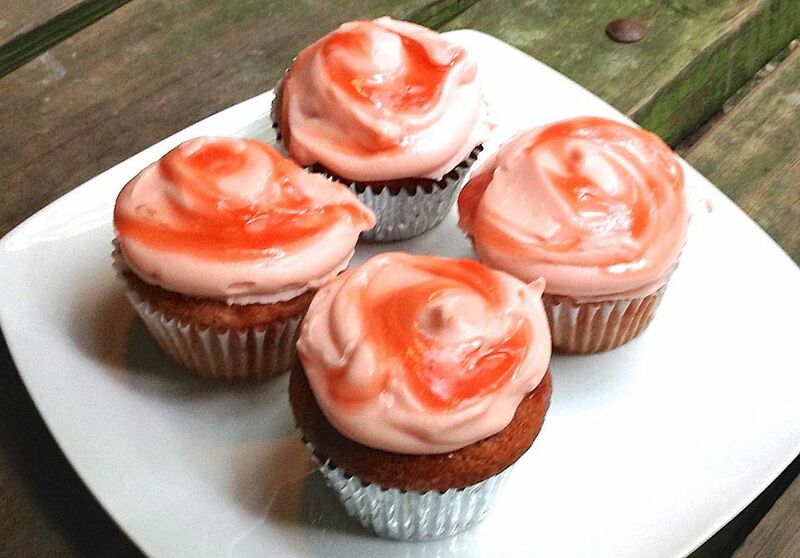 Guava and cream cheese is a favorite flavor combination that translates naturally to cupcake form. The cake is soaked with guava syrup before it is topped with a rich cream cheese frosting and decorated with a guava glaze. For best guava flavor, look for guava nectar that contains guava pulp in the ingredient list and does not have other fruit juices such as apple juice. Pour 2 cups of guava nectar into a measuring cup and set aside. Place the remaining guava nectar in a medium saucepan. Bring to a simmer over medium heat, and simmer until liquid is reduced to 1 1/4 cups. Remove from heat and let cool. Preheat oven to 350 degrees (F). Line 24 cupcake molds with paper liners. Place the cake mix in the bowl of a standing mixer. Add the 1 1/4 cup of guava nectar that was reduced on the stove. Add the eggs, vegetable oil, vanilla extract, and lime zest. Mix until well blended. Mix in a few drops of red food coloring (optional) and blend until color is solid. Divide batter among the prepared cupcake pans. Bake cupcakes until they spring back lightly to the touch, about 20-25 minutes. Place the reserved 2 cups of guava nectar in the same medium saucepan along with 1/2 cup sugar and a pinch of salt. Bring mixture to a simmer and cook for 3-5 minutes, or until slightly thickened. Remove from heat, and carefully transfer 1 cup of the syrup to a heatproof bowl. Place the cornstarch in a small bowl and whisk 1-2 tablespoons of the guava syrup into the cornstarch to make a smooth paste. Return remaining syrup to the stove, whisk in the cornstarch, and bring to a simmer. Continue to cook, stirring, until mixture thickens. Cook for 1-2 minutes more, then remove from heat and stir in the butter. Strain if needed. Set guava glaze aside to cool. When the cupcakes come out of the oven, prick them gently with a toothpick, then brush the cupcakes evenly with the reserved guava syrup (the guava/sugar mixture without the cornstarch), letting it soak into the cake. Place the cream cheese, warm guava jelly, and a pinch of salt in the bowl of a standing mixer and beat until fluffy. Add the powdered sugar in parts, alternating with the milk and vanilla, beating well after each addition, until frosting is light and fluffy. Spread or pipe frosting onto cooled cupcakes. Drizzle the guava glaze (mixture with cornstarch) over the cupcakes, or swirl the glaze into the frosting.